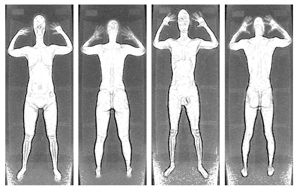 The Transportation Security Administration (TSA) has beat a deadline to stop conducting its controversial “backscatter” security scans (shown at right) displaying graphic representations of your naked body to government workers. The new scanning technology uses radio waves to conduct a search, which is thought to be safer than the X-rays used by the older technology. Now, Instead of airport scanners showing detailed images of your body to strangers, TSA agents will see a generic human image that represents you. A small colored box will appear on the screen if a suspicious item is detected. Congress passed a passenger privacy law in 2012 demanding the TSA revise its intrusive protocol and switch to this kind of less-invasive scan. Airports had until June 1, 2013 to replace older scanners with new technology, and according to TSA head John Pistole, all airports were outfitted with these radio wave scanners by May 16. Though the new scans go much further to protect your privacy, there are still plenty of privacy-related questions yet to be answered, such as whether or not data from these new scans will be saved. Privacy advocates are concerned that, despite the government's effort to make these scans less intrusive, potentially identifying information may still be stored on a short- or even long-term basis. There’s nothing fun about going through airport security, and while better technology won’t make the experience more enjoyable, at least you can rest easy that a stranger isn’t viewing you naked anymore. And if you want to make your trip through security even faster, you may want to consider investing in a TSA-approved laptop bag to keep all hangups at a minimum.